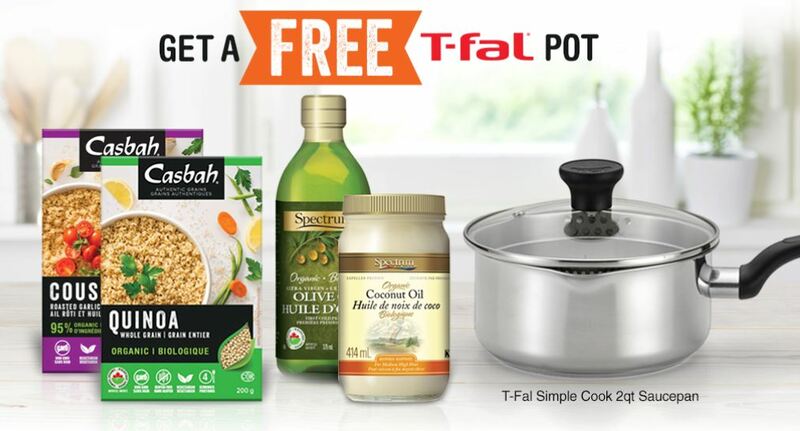 Casbah and Spectrum have a new Cooking Made Easy promotion, where you will receive a free T-Fal pot when you purchase four Casbah or Spectrum products! You can purchase any combination of products, and the purchases do not have to be on the same receipt. Once you have submitted receipts for all of your qualifying purchases, your T-Fal Simple Cook 2qt Saucepan will be on the way. This offer will run until September the 15th, 2018, or until supplies have run out. Your receipts can be submitted by clicking the link below, You will also receive an email letting you know your submission has been approved, and once your submissions are complete, you will also be sent an email confirming that your T-Fal pot is being sent to you.. There is a limit of one pot per household. Click here to submit your receipts and claim your free T-Fal pot. I am a little upset that I bought the 4 products even though I did not need 4 of them and got home only to find out the offer expired. I think it should be on the outside of the coupon or the store should take off the coupins if it has expired.